Looking behind my camera lens, I was able to witness the dynamics of how each member of the MLAC group worked with love, compassion and sincerity. The participants immediately responded to the team’s natural way of connecting, by participating actively and sharing their personal experiences. I had to take a step back and reflect how meaningful it was to see how pakikipagkapwa tao was coming into play. In that particular moment, I felt we were all in sync, wanting and needing to understand what it really meant to be a good parent. Dr. Ma. 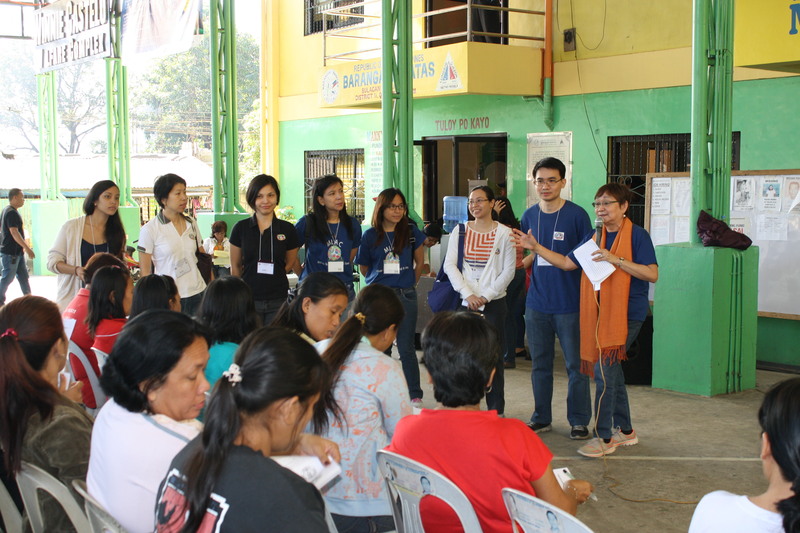 Lourdes “Honey” Carandang headed the team’s parenting workshop at Barangay Payatas, Quezon City. Dr. Honey provided valuable guidelines in helping parents develop a healthier and closer relationship with their children. She began with the topic on how parents can develop effective ways of communicating better with their children. To speak with each other effectively we must always be governed with love and respect. Communication has always been most effective when the said elements are at play. It is not simply getting our messages across and be heard but rather, it is an opportunity to also make our loved ones feel they matter by listening when a child has something to say and to listen to understand especial at times of disagreement. Dr. Honey emphasized further, it is essential to value the child’s emotions and capabilities and to open our eyes to their purity. We can learn from children if we allow them the freedom to express themselves. The old saying “bata lang yan” does not apply in any way in raising our children effectively, because they have a mind of their own and have feelings too. The value of disciplining the child with dignity was highlighted as well during her talk. No put downs, no insults and no labelling of the child. Children crave for structure and discipline because it makes them feel safe knowing their parents are watching out for them. Even at times when they do not get what they want. As parents, we can get consumed by our day to day concerns that we don’t realize our children watch us. Parents become the first teachers and role models to children. They see how we communicate with people, and how we behave in and outside the home. Children immediately pick-up from how we conduct ourselves socially and they also learn from how we decipher right from wrong. They absorb these information quickly that it eventually becomes part of who they are. We have the responsibility and even the advantage to teach our children the correct thing by “doing right.” Here are a few of the ideas that were mentioned during the workshop: knowing to apologize when one makes a mistake, saying please and thank you when appropriate, and teaching the value of honesty. To strengthen the family bond even further, Dr. Honey talked about spending quality time with the children. Taking the time to bond with them strengthens emotional connectedness. It does not necessarily have to be expensive. The participants suggested inexpensive ways to bond with their family such as, going to church, playing with the children, doing general cleaning. The idea is to spend quality time with the family and create rituals for each one to look forward to. The family must find happiness doing things together while enjoying each other’s company. The journey of family life has its own challenges and they do not need to be handled alone. Dr. Honey emphasized the value of having a support group. Spending time with a group of people who understand what you are going through can provide helpful comfort. They can be formed from organizations, mental health practitioners, or a group of people one can trust. Self care was another important topic that was also highlighted during the workshop. Many participants suggested ways of self care by getting manicures, pedicures, massages, buying something special just for themselves or anything to make them feel pampered. Taking the time to care for the self helps parents recharge from their daily routines preventing burnout. 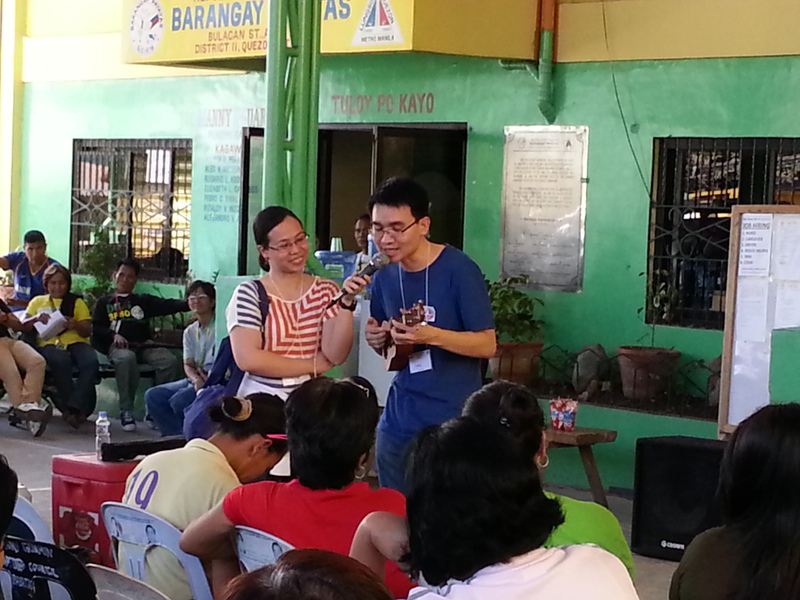 Chris rendering a song to the participants with his wife and fellow MLAC member, Olive, assisting him with the microphone. There is an African proverb that states “it takes a whole village to raise a child.” As Dr Carandang stated, when one neglects a child, the implications goes full circle not only involving the family as a unit but also the community and the nation as a whole. Through my camera lens that day, I witnessed the dynamism and interplay that the MLAC team undertook with the community. This was wonderful. The fact that endeavors like this are essential to the Filipino well-being give me the inspiration to make this “my way of life” in my psychological career as a service to others. *** Ms. Rachel Ann Peddy kindly volunteered to take pictures and write a brief documentation for us during this Parenting Workshop. She, herself, is a parent of a beautiful daughter. Thank you again, Rachel, for your wonderful pictures and this reflection.